There are many, many reasons to replace your old windows: material rot, drafts (especially here, in Brampton, ON! ), condensation forming between or on window panes, rising energy bills, damage to frame/glass, upgrades, preparation to sell, ambiance, etc. We have heard it all—and we have assisted with it all! At Brock Doors and Windows, our business is two-fold: beautiful craftsmanship and happy customers. Happiness is closely tied to health. Over the decades, we’ve come to understand replacement windows are more than a feature of your home—they can actually enhance your overall health through providing your family added natural light. Stick with us, our team has done the research! Check out these key benefits! Increases Productivity: According to many studies over the past 5-10 years, people who spend more time exposed to natural light (versus artificial light or too much darkness) are actually more productive! How? Light directly affects melatonin regulation, which subsequently affects overall alertness and productivity. Reduces Depression: natural light releases hormones we all need to function at full capacity. The sun’s light is widely accepted as a serotonin-booster which is closely linked to elevated moods, and staving off depression. Struggling to focus? Look around your house and assess: do you have an adequate amount of natural light? Does your home face either the sunrise or the sunset? Could you or someone in your family benefit from an added skylight or additional/larger windows? Reduces Eye Strain: With cell phones, television, tablets, and computer screens—our eyes put up with a lot. Ocular migraines and eye strain are all too common, now. Relying on natural light whenever possible will help alleviate pain and potentially developing vision issues! From the team at Brock: throw those curtains open! Reduces Mildew and Mold Growth: Gross! Yes, we agree. Mildew and mold need damp, dark places to grow and thrive. Natural light combats the conditions these (icky) health-threatening fungi present. Areas most at risk: bathrooms and kitchens. When you’re ready for your next project, let’s discuss adding a beautiful tempered glass picture window to your master bathroom or a small bow window to your kitchen! Lack of light can cause Season Affective Disorder (also known as Seasonal Depression). Exposure to natural light has been linked to increased performance in school children and working adults. Increased Vitamin D: normalizes the immune system, body weight, and asthma symptoms. Light Therapy stems from research surrounding the importance of natural light for the treatment of a plethora of health issues, including psoriasis, cancer, wound healing, depression (both seasonal and non-seasonal), sleep disorders, jet lag, and jaundice. Who knew how amazing natural light could be? 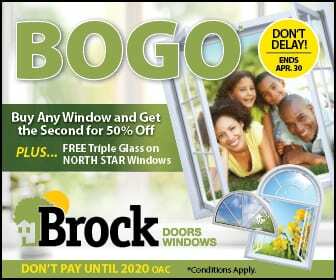 The team here at Brock Doors and Windows wants the residents of Brampton and the surrounding areas to be healthy and surrounded by these beautiful Brampton, Ontario replacement windows. Your health is as important as your happiness and we can’t wait to work with you!